Looking to improve workplace collaboration & productivity within your law practice? Miles Hischier, of HiView Solutions, a Google Integration Partner, authored this article for Lawyer Meltdown to share insights about how law firms can use Google G Suite for work email, project collaboration, and document storage. Learn about G Suite and the popular features relevant to a law firm.
. G Suite also includes administrative tools through the G Suite Admin Panel. Google offers 3 plans: G Suite Basic ($5/user/month), G Suite Business ($10/user/month), and G Suite Enterprise ($25/user/month). This article focuses on G Suite Business, which is appropriate for law firms with fewer than 250 employees. Suggesting Mode. Google Docs allows you to ‘track changes’ and provide specific feedback inline within a particular document. Suggestions appear in colored text and can be “accepted” or “rejected” by other editors. Commenting. This feature can be utilized to provide metadata or commentary about a specific inline edit. Just like Microsoft word, comments are captured & labeled with the commentator’s name. Version Control. Instead of manually versioning files by name & date, Google automatically saves all edits. At any time, you can review the entire version history of a document and identify who made the last change and what specifically was changed. Interoperability with MS Word. Google Docs can be downloaded into MS Word Docs. Google Doc Suggestions & Comments will also transfer into the Word doc as well. With G Suite Business, you get unlimited storage (with 5+ users) and Team Drives, which enables law firm ownership of files/folders instead of Drive file ownership at the employee level. Team Drives. Team Drives can be a useful complement to your case management system. For instance, you can add multiple Team Drives, organized by client name or by case, and then archive Team Drives over time. With unlimited storage & Google Vault for data retention (see below), you’ll have an easy search panel to cull through old files down the road if needed. Work with MS Office Files through Filestream. Filestream was created so you can easily work in MS Office from your local computer and save new versions to your Google Drive account. Filestream is a Dropbox-like sync client that connects to your G Suite account and automatically uploads a new version of your MS Office Document to G Suite. You only need to select the Filestream folder through Finder on Mac or Explorer on Windows. Mobile Device Management. If you have employees accessing work data on their own mobile devices, you can use Google’s built-in mobile device management service to enforce a device passcode, helping ensure that a lost iPhone doesn’t compromise your firm’s information. Further, admins can configure ‘account wipe’ which enables you to remove all firm data from the mobile phone without deleting the employee’s personal data, like photos. Drive Sharing Controls. Since law firms handle sensitive information, we recommend that you disable external link sharing. This means that links can be shared internally, or with clients/partner organizations that have been whitelisted through the G Suite Admin Console. If someone outside of this protected realm needs to access a document, they can still be added directly to a file as “contributor,” but will need a Google Account to access the file. This way, you always know who your information is being shared with. With external link sharing enabled, anyone with the link can open that file. Security Controls. From 2-factor authentication to usage reports, there’s a range of security control options that administrators can enable through the Admin Console to ensure G Suite is secure. Read more about G Suite Security here. Google Vault (eDiscovery & Retention). Google Vault enables law firms to archive historical mail, chat, and group history. Google Drive Files can be archived as well. 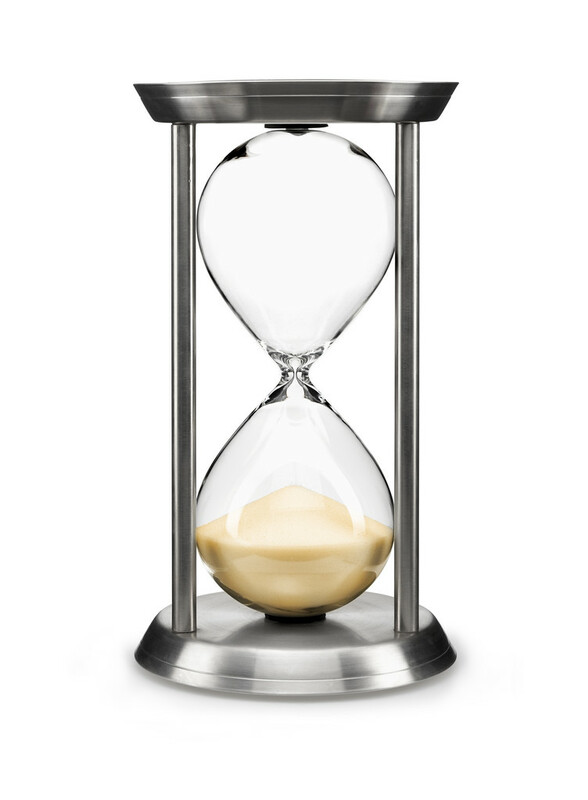 Firms can enable a default retention rule, such as “save indefinitely” to retain information. Google Vault can also be used for Legal Holds, Search, and Exporting data. Audit reports are also available to show actions taken by Vault users. Google Meet is a scalable and stable audio/video solution. Google Meet offers a way to join via URL from a computer, as well as a unique dial-in number & meeting PIN. This way, you can present yourself on camera to your clients or colleagues in another location and review documents together. Sometimes, it might be useful to simultaneously share a Google Doc so you can collaborate in real time on the call as well. G Suite Enterprise is quite a step up in price but includes the option of recording calls if you desire that functionality. 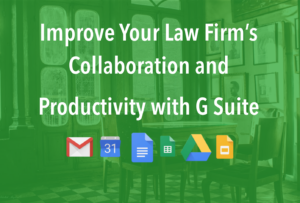 G suite offers law firms a collaborative set of tools that provides alternative workflows to the traditional Outlook/MS Word combo that many law firms rely on today. Plus, as you bring younger lawyers into your practice, there’s a strong chance they’re well versed in this set of tools already. Google offers a very similar toolset in their G Suite for Education package, and younger employees (most people under age 35) bring Google Apps knowledge with them to the office. For employees less familiar with Google products, a quality Change Management engagement with a Google Partner like HiView Solutions can help you convert even the most stubborn employees over to new ways of working. To learn more about G Suite, visit gsuite.google.com. 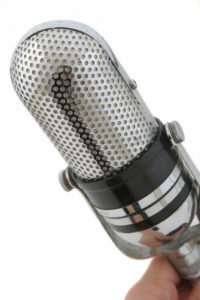 I was recently interviewed by Law Firm Suites for their “Ask the Expert” series. They asked me for some tips for avoiding lawyer meltdown, as well as other tips for solo practitioners, especially new solos. To be a great lawyer (or any type of service provider), you have to be a whole and complete person – and to be a whole and complete person, you have to have a life outside of work. To help others you have to fill your own well first – not just financially, but emotionally and creatively, too. Make sure you make time for yourself and the things you enjoy. And if you need help with your practice, or if you’re a new solo, the interview covered a range of topics, including establishing a niche practice; learning how to turn away work; staying motivated; and necessary tools for solos. If you’re interested, you can find the complete interview here. Having difficulty managing your workload? 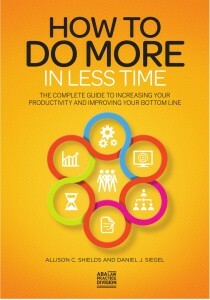 Think you could be more productive? 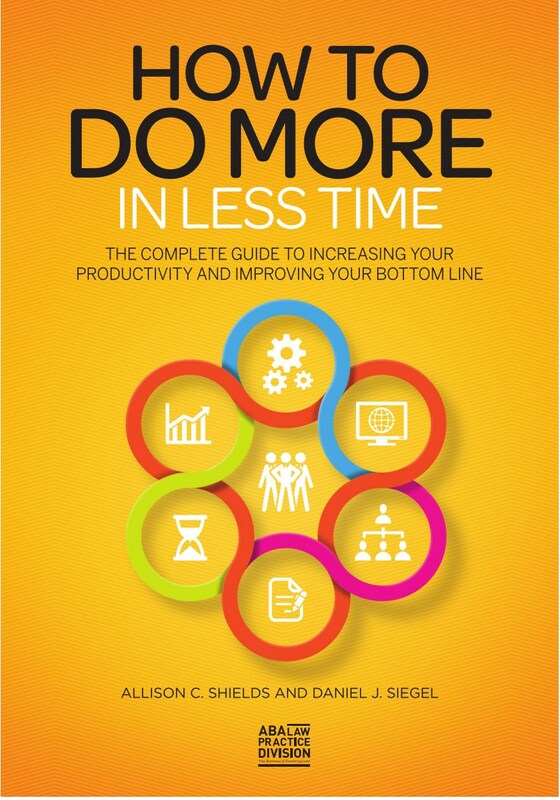 My newest book, How to Do More In Less Time: The Complete Guide to Increasing Your Productivity and Improving Your Bottom Line may help. The first part of the book will provide you with strategies to help you manage your day to day tasks, while the second part of the book will give you specific tips on how you can shave time off of everyday tasks by using the software programs you’re already employing in your law practice more efficiently. Listen to this podcast interview with me and my co-author, Daniel J. Siegel. LinkedIn’s previously named “Skills and Expertise” section has been re-named “Skills and Endorsements” in part due to feedback LinkedIn received from lawyers who advised that many jurisdictions (including mine – New York) would not allow lawyers to complete any section under the title “expertise” without special certifications. The newly-named “Skills and Endorsements” section should cause less ethics headaches for lawyers. However, there are still cautions. To learn more about endorsements, check out my article on Law Technology Today, LinkedIn Endorsements 101. In another article on Law Technology Today, I talked about LinkedIn Company Pages. That article gives a good overview of what lawyers can do with LinkedIn Company Pages for their law firms, but as of April 14, 2014, LinkedIn will be eliminating the Products and Services tab from LinkedIn Company Pages. It turns out that not too many users were taking advantage of this feature of Company Pages. In place of the information that used to be contained in the Products and Services tab, LinkedIn recommends two options. First, you can post Updates to your Company Page about your services. These Updates will appear both on your Page and in your followers’ LinkedIn feeds. You can even include video in your Updates. While this is one option, you may want to use this option for announcements of new services or initiatives, news or other timely items, rather than general descriptions of your practice areas and services. Your other option is to use Showcase Pages to highlight specific services that your firm might offer. Showcase Pages were introduced by LinkedIn in late 2013 as a way to highlight specific products or services, or to allow businesses to reach specific audiences who might be interested in only a segment of the company’s offerings, rather than their general Company Page updates. Essentially, Showcase Pages are sub-pages under your main law firm Company Page on LinkedIn, but they are dedicated to one individual service that you provide. Showcase pages can be helpful for law firms who have diverse practice areas and want to post different content to different audiences. As legal marketing expert Nancy Myrland noted in her post announcing Showcase Pages last year, Showcase Pages can also be a great way to institutionalize cross-selling, because all of the Showcase Pages link back to the main Company Page and to one another. To find out how to drive traffic to your Company Page, you may want to read my post from the Legal Ease blog, “Driving Traffic to your Law Firm Company Page.” These concepts can be applied to your Showcase Pages as well. 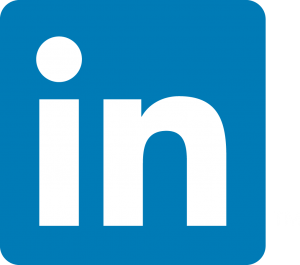 LinkedIn has been adding some tools within the platform to help you see how much attention your LinkedIn Profile, updates and Page are getting. For example, the “Who’s Viewed Your Profile” feature of LinkedIn now gives you lots of information about the industries and locations of the people who have viewed your Profile, as well as information about how they found you (LinkedIn search, Google search, etc.) – even with a free account (although premium accounts provide even more information). In addition, at the bottom of the “Who’s Viewed Your Profile” screen, LinkedIn will also give you suggestions about how you can garner more Profile views. If you post Updates to your LinkedIn Profile, on your Home Page LinkedIn will provide you with information about how many views and likes your recent Updates have received under “Who’s Viewed Your Updates” in the right sidebar. If you manage a Company Page for your firm, you’ll get Analytics (stats on the number of impressions, clicks, and interaction) and Page insights (Page views, unique visitors, page clicks). LinkedIn recently made some changes that will now allow you to block individual users on the platform. Simply go to the person’s Profile that you want to block and click the down arrow next to the blue button you see on their Profile and click on “block or report.” For more details, including what blocking means on LinkedIn, stay tuned for an upcoming post on Law Technology Today explaining how you can do it.